Preliminary injunctions…Prior to law school, had you asked me what a preliminary injunction was I probably would have said, generally, that an injunction is a legal remedy to stop someone from doing something. Now, post-law school and after approximately 13-years of legal experience, I know now that I would have been only partially right prior to law school. First, I understand that preliminary injunctions are extraordinary measures. But don’t extraordinary circumstances call for extraordinary measures? There are 2 types of injunctions: preventive and mandatory. A provider’s Medicaid contract is terminated…a preventive injunction can be put in place to stay the termination until a determination of the termination’s validity (Secret: If any entity other than the Department of Health and Human Services (DHHS), Division of Medical Assistance (DMA) terminated the Medicaid contract, most likely, the termination is not valid). A provider’s Medicaid reimbursements are suspended…a preventive injunction can be put into place to stay the suspension of payments until a determination of the suspension’s validity. A provider, who has provided Medicaid services for years and has had a Medicaid contract with DHHS for years, is denied enrollment by a Managed Care Organization (MCO)…a mandatory injunction could force the MCO to contract with the provider. The last example is an example of a mandatory injunction. Mandatory injunctions, generally, are more difficult to convince a judge to order than a preventive injunction. 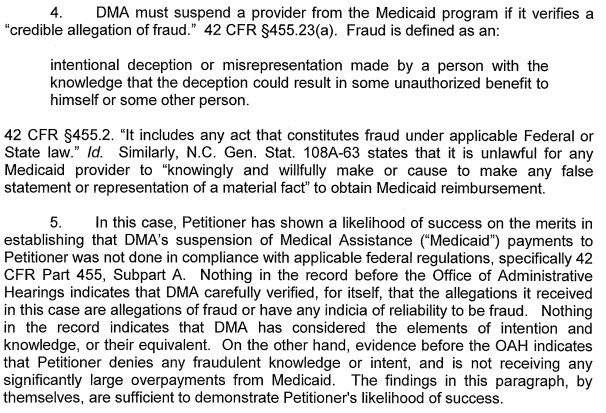 However, in the context of Medicaid, generally, the providers have compelling stories that will warrant any type of injunction…extraordinary circumstances. But a preliminary injunctions is not the first step. Normally when I draft a Motion for Preliminary Injunction, I use North Carolina Civil Procedure, Rule 65. (a) Preliminary injunction; notice.  No preliminary injunction shall be issued without notice to the adverse party. (b) Temporary restraining order; notice; hearing; duration.  A temporary restraining order may be granted without written or oral notice to the adverse party or that party’s attorney only if (i) it clearly appears from specific facts shown by affidavit or by verified complaint that immediate and irreparable injury, loss, or damage will result to the applicant before the adverse party or that party’s attorney can be heard in opposition, and (ii) the applicant’s attorney certifies to the court in writing the efforts, if any, that have been made to give the notice and the reasons supporting the claim that notice should not be required. Temporary Restraining Order? I thought we were talking about injunctions!!! Now I am confused!! Notice that, according to Rule 65, a preliminary injunction may NOT be issued without notice to the adverse party. However, a Temporary Restraining Order (TRO) CAN be granted withOUT notice to the adverse party. How this plays out in real life is that, when I want an injunction, I file a “Motion to Stay, Temporary Restraining Order, and Preliminary Injunction.” I file the Motion in the Office of Administrative Hearings (OAH), which is great, because, generally, the Administrative Law Judges (ALJs) have a deep understanding of Medicaid laws, rules and regulations. According to Rule 65, the Judge, in his or her discretion may grant the TRO, then schedule the preliminary injunction within 7-10 days. The fact that a Judge can grant a TRO quickly and without notice to the adverse party clearly shows how extraordinary a TRO is. Alice is a health care provider who accepts Medicaid. Alice has a small practice; she only has 3 employees and maybe 40 clients. She provides mental health care to needy adults in Mecklenburg county. MeckLINK is her MCO. On August 1, 2013, MeckLINK sends correspondence to Alice stating that as of August 5, 2013, Alice’s Medicaid contract will be terminated. Alice panics. Not only is her small practice her only source of revenue…her livelihood…her career, but she would have to close her practice immediately if MeckLINK failed to pay her even one time. If you do file a Motion to Stay, TRO and Preliminary Injunction and the Judge follows the legal protocol, the TRO should be granted within a few days. Then a preliminary injunction (PI) should be scheduled within 7-10 days. At the PI hearing, you must show: (1) likelihood of success on the merits; and (2) irreparable harm. How do you show likelihood of success on the merits? Well, in my example, MeckLINK was the acting entity taking the action to terminate Alice’s Medicaid contract. But federal law dictates that a single state entity manage Medicaid. It is my position that MeckLINK does not have the authority to unilaterally and without DHHS’ express authorization to terminate a Medicaid contract. Make the argument…show likelihood of success on the merits. How do you show irreparable harm? Damages must be more than just monetary. Damages must be irreparable…as in, not fixable with mere money. Obviously, monetary damages are at issue. But also, goodwill/reputation in the community, staff morale, fear of bankruptcy, effect of bankruptcy on Alice, Alice’s family, staff, effect on Medicaid recipients (not receiving the medically necessary services), impact on the community, etc. Show irreparable harm…get the PI. Once you meet your burden of proof for preliminary injunction, then the injunction is upheld until a full hearing on the merits. Usually, the full hearing on the merits will not be scheduled for many months. So the PI enables you to continue to do business as usual…as if no termination had ever been threatened. Status quo. (The existing state of affairs). Had Alice’s TRO and PI NOT been granted? Alice would have lost her business. Her 3 staff members would have been unemployed. Alice’s family would have been without income. Her 3 staff would have been without income, perhaps they would have applied for unemployment. Her landlord would not have been paid. The 40-ish Medicaid recipients would not have received medically necessary services. The Medicaid recipients would have decomposed…perhaps becoming hospitalized or incarcerated…or on the street. Alice’s reputation in the community would have been that “MeckLINK shut Alice down! She must have been doing something wrong.” Alice would have become depressed…convinced that she were a failure. Alice, due to zero income, would have lost her home; her husband would have left her. (No one can really comprehend the harm of closing a business. The consequences could be more dire than my description). These are extraordinary circumstances. And extraordinary circumstances call for extraordinary measures!